No Bull: Imminent Rate Cut? 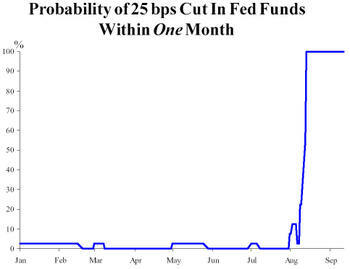 Economic surveys are now predicting an imminent rate cut at Tuesday's meeting (26% chance of a 25bps cut to 5.00%; and a 74% chance of a 50bps cut to 4.75%). Members of the FOMC have been delicate with their words recently, and the stock market has followed suit: neither indicating a decision either way. While the market has not been enthusiastic, we can certainly say that it is optimistic. With such high expectations of a cut in the target rate; we must ask, what will happen if rates are unchanged? The FOMC meeting one week from tomorrow puts the economy in the spotlight for the next week. Retail Sales, Industrial Production, Capacity Utilization, and Business Inventories are some of the many numbers scheduled to be released this Friday. Below we look at a few key indicators and how they have changed since the last rate hike, on 6/29/06. If not immediately clear, the case for a rate cut lies directly with the weak Nonfarm Payrolls and Housing Starts numbers. CPI has been nearly flat, which eases inflation tensions, and a flattening unemployment rate may prompt early action on the part of the Fed. As we see it now, there is no overwhelming evidence for a decision either way. Market turmoil has put the Fed in a difficult position. If the target rate is in fact cut next week, that response could be seen as a sign of weakness after pressure for such a decision. We believe that the media will place increased scrutiny on this week's indicators, but would remind our readers that the FOMC's decision will most likely lie more with estimates than current conditions. For more in depth analysis, including market and sector performance during Fed easing cycles, subscribe to the Birinyi Mini-Institutional Service. 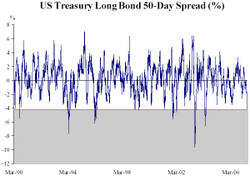 Since 1990 there have been only eight other periods where bonds have been more oversold. We measured the US Long Bond futures contract against its 50-day moving average. Currently the bond price is -4.26% below the 50-day, and, as shown in the table, the average peak was -6.25%. 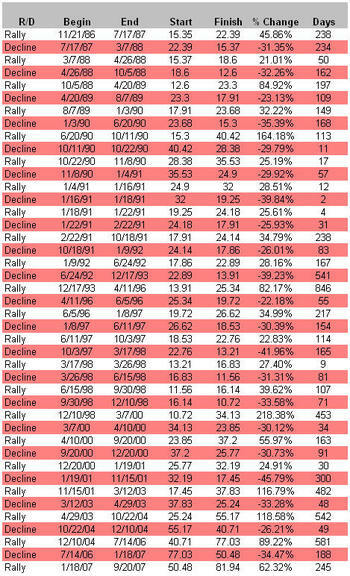 On average the market has rallied out of these periods, although rallies hardly dominate the total occurrences. Friday’s CPI report, which showed a slight up-tick in year over year core CPI, lowered investor expectations of rate cuts later in the year. Furthermore, with core inflation (2.7%) running above the Fed’s preferred range of 2.0%, it solidified expectations that following this week’s policy meeting, the Fed would remain on hold and maintain its bias that upside risks exceed the downside. 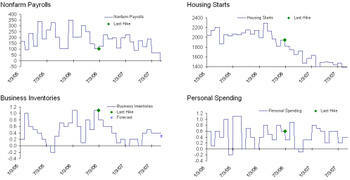 A look at the historical record however indicates a different picture. The chart below displays the year over year core CPI since 1960 along with the Fed’s current preferred rate of inflation (red line). 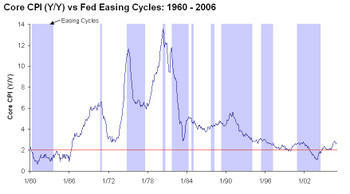 We also noted with shading each of the periods where the Fed was lowering rates. 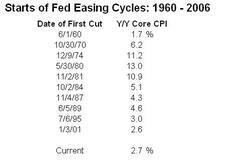 As the chart illustrates, in the ten easing cycles since 1960, the core inflation rate has only been below 2% at the start of an easing cycle during one other period. In fact, if the Fed were to start easing monetary policy with inflation at current levels, it would mark the third lowest inflation rate at the start of an easing cycle. While we wait over the next two days for the Fed's ultimate decision regarding interest rates and the wording of their statement, we thought we would share the following chart which summarizes one of the key factors policy-makers will be considering over the next two days- inflation. 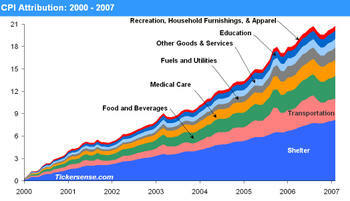 Over the last seven years, overall prices as measured by the CPI have risen about 21%. Of that gain, the cost of shelter is responsible for over 40%, followed by transportation and food and beverages, with each comprising about 14% of the total gain. On the plus side, the fact that real estate prices are flat-lining (or in some cases falling) and energy prices have been declining bodes well for the inflation outlook in the shelter and transportation components. On the negative side, the rising prices for food and beverages are probably on the minds of Fed governors as a red flag. Inflation on the Come Back? Over the last year and a half we have found that the ISM Commodities Survey has been an effective barometer of future inflation. When the number of commodities rising in price has risen, year over year CPI tends to follow in the coming months. Likewise, when the number of commodities rising in price declines, inflation has tailed off in the ensuing months. Currently, the ISM commodities survey has indicated that the number of commodities rising in price rose from the prior reading in three out of the last four months. The last time we saw this was in December 2005, which was followed by an up-tick in inflation last Spring that sent global markets reeling. While it is not necessarily pertinent to today's report, investors should keep this on their radar in the months ahead given the indicator's past reliability. Longer term, the ISM Commodities Survey still remains below its downtrend from the peak readings in 2004. In this month's ISM commodities survey, respondents said they saw price increases in five commodities and price decreases in six, for a net of minus one. Below we have updated our chart which shows the relationship between the ISM commodities survey and the CPI. 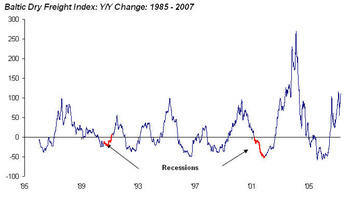 Historically, trends in the CPI have been preceded by the ISM survey. If this month's survey is any indication, then the up tick we saw in December's CPI report will prove to be short-lived.